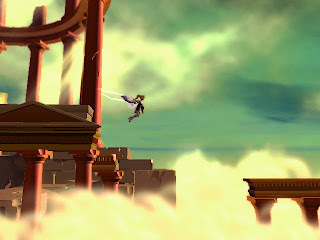 The game itself is a 2.5D platformer, where you run, jump, float, move obstacles, and shoot lightning as Nyx. 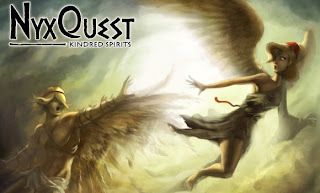 She is an angelic creature who must explore the post-apocalyptic ruins of ancient Greece for Icarus, a common figure in Greek mythology and her apparent love interest. As you progress, the Gods will grant you new powers such as manipulating the direction of the winds, enemy projectiles, and other assorted pieces of the environment she would not be able to budge otherwise. The level design and difficulty balance are very well done. The game is challenging, but fair, and without being a frustrating throw-your-controller-across-the-room experience. Relative to other WiiWare titles, the graphics in NyxQuest are very clean and crisp, if not slightly unpolished. The animation is fluid, and the backgrounds are amazing. The music is very Greek, for lack of a better word, and adds to the overall atmosphere significantly. Also, props to Over The Top for naming the majority of the levels after real Greek cities and locations (Thessaly, Argos, Mt. Parnassus, etc). However, there are some rough edges and there isn't a whole lot of variety in the areas you explore (usually a sandy/mountain area during the day/night). The game is also very short and can usually be completed in less than 3 hours, although I suppose that's to be expected. Overall, not bad for 4 Spanish guys on a shoestring budget. This game gets a *Slaytanic!